INTRO & ADVANCE CLASSES AVAILABLE! *Digital Gym MEMBERS receive 25% off cost of registration* Become a Digital Gym Member TODAY! Need based scholarships are available for students who qualify for the free and reduced lunch program at school. (2921 El Cajon Blvd, San Diego, CA 92104). Since 2001, the Media Arts Center San Diego’s Teen Producers Project has been inspiring youth to be more than consumers of media as they become creators of media. 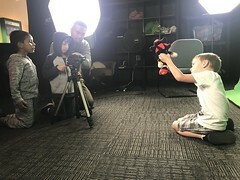 Through our programs, hundreds of youth throughout San Diego County and Orange County have learned about filmmaking and digital storytelling and have produced engaging video projects. The project’s mission is to educate youth in media arts & emerging technologies for use in self-expression, communication and social change.